Ding dong... Please welcome this week's houseguest Cindy of quaint handmade. I've been meaning to invite my favorite bloggers over and after a couple of minutes on her blog a couple of weeks ago I finally said that's it. Stop procrastinating. Go on, ask her. I'm so happy Cindy found some time to stop by and share this special post with us. I'm so happy to be a guest on Heart Handmade, which is one of my favorite creative inspirations. When Marichelle asked me to create a post, I had several ideas running through my mind, but after seeing the beautiful Swedish movie, Everlasting Moments, the decision was easy. I'm a big fan of all things Scandinavian and chose some favorites I hope you will like, too. Cindy it was nice to have you over. Come by anytime!! I'm a marketing guru and write about life in NYC with my dear husband Scott on our blog, quaint handmade. I also love to make things and take photographs. I find a lot of inspiration in anything from Top Gear to the Museum of Modern Art, but mostly from my incredible blogging friends, the handmade community and Flickr. I'm often afflicted with 'I want to do that, too' complex, which means I'm always into something new. I love Cindy's perspective. I enjoy the breath of fresh air each time I visit her. So wonderful - I love Cindy and her great blog! Love Cindy and love her picks...great feature Marichelle! What lovely picks! Cindy has such a great eye for beauty, and this is a splendid guest post. thank you so much everyone and to marichelle for inviting me to be a houseguest! YAY! Cindy! I adore Cindy and am so happy to see her over here on HH! You are adorable sweet Cindy and I love your fresh and springy picks. Those roses? Wow. To die for....This is so much fun, this series. I love it! i love cindy and her fabulous blog and i love everything here! LOVE!!! fantastic picks (as usual!) 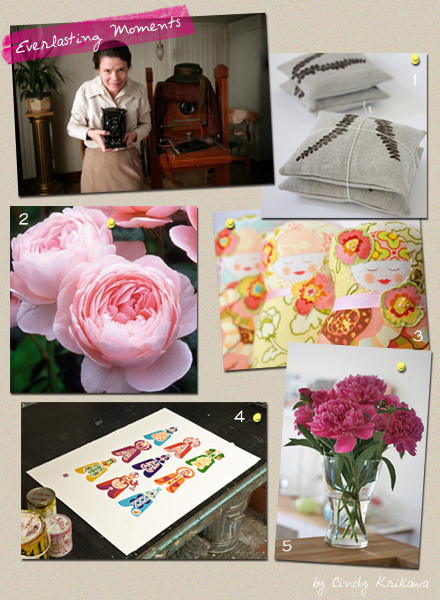 Cindy (especially Lotta's little pillows) and love to Marichelle for choosing Cindy to highlight!